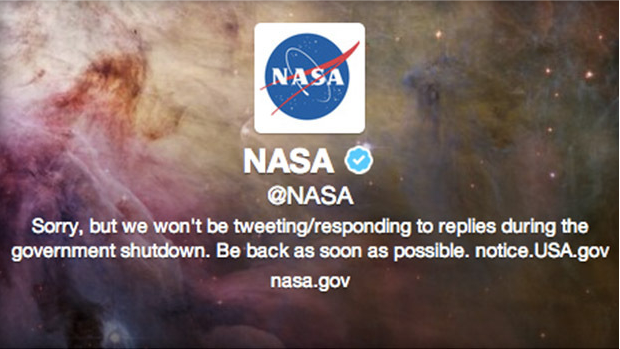 This image appears on NASA’s Twitter page, a direct response to the shut down. Today is NASA’s 55th birthday, but there is no one around to celebrate. Why? 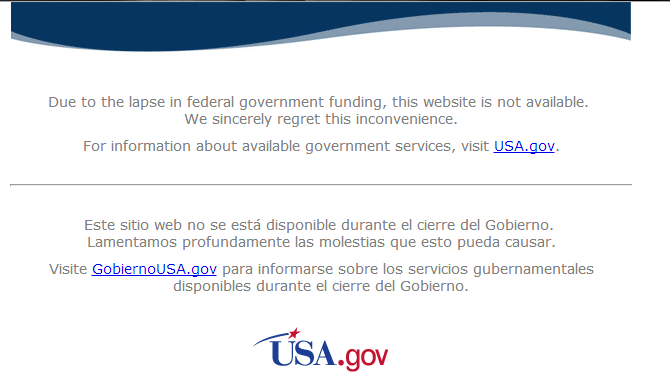 Because today is also the day that NASA will shut down since the U.S. government failed to pass a budget. Ultimately, this shut down means that operations will stop in a variety of government sectors. All in all, 41% of federal employees will be furloughed (forced to take an unpaid leave of absence). This includes most of NASA’s 18,000 employees. In fact, it includes 97% of them. Only 600 NASA employees are expected to continue their work. Of course, the crew abroad the International Space Station will not be abandoned. Mission control will continue to operate to ensure the safety of the crew. Additionally, operations will continue on satellites already in orbit. NASA will continue to monitor this technology and ensure that it does not malfunction; however, if a satellite has not been launched, all work related to the project will generally cease. Case in point, NASA is planning to launch the Mars Atmosphere and Volatile EvolutioN (MAVEN) spacecraft in November to examine the Red Planet’s atmosphere. The government shutdown will cause a number of issues for this project, and NASA may miss their launch window. Since a specific planetary alignment is needed for the voyage to Mars, missing this date means that NASA wouldn’t be able to launch until 2016. But what does all of this mean for the general public? How will the NASA shutdown impact us? First, it is a serious blow to the Hubble Space Telescope. Though the telescope will continue to operate, the researchers in charge at the Space Telescope Science Institute in Baltimore will not be at work to analyze data or produce images. Similarly, The Mars rovers will continue to operate, but with the Jet Propulsion Laboratory’s website shut down, we won’t really be getting any updates. After a week, the contracting company that NASA employs to control the rovers will run out of funds. At this point, the rovers will cease new exploration–they will no longer be roaming over the rocky surface of the dusty planet. They will go into hibernation until the government starts back up. It is unfortunate that scientific exploration and the search for new knowledge can be so easily put on hold by politics and spending issues. However, there are a number of other countries that are still conducting research, posting updates, and carrying on as usual. So, although this shutdown is extremely detrimental to NASA, it does not mean that all space exploration is on a hiatus. The work continues elsewhere.